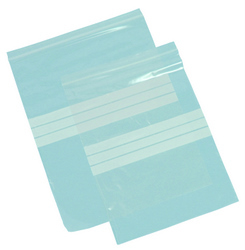 Write On Panel Grip Seal Bags (also referred to as Minigrip Bags) are manufactured from strong clear polythene. The write on panel helps to identify products and means extra labelling is unnecessary. Ideal for small multiple products requiring identification. Squeeze grip bars together to seal, stays firmly closed, easily re-opened when required. Multiple re-use. Ideal for items which need to be secured and reopened multiple times.